Americas Beverage of Moderation Beer 1956 Ad. 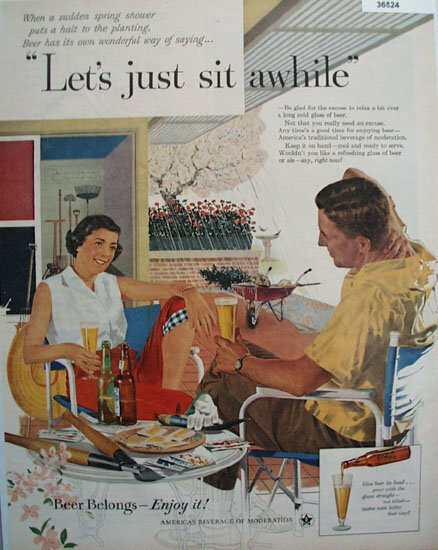 This color June 12, 1956 ad by United States Brewers Foundation states When a sudden spring shower puts a halt to the planting, Beer has its own wonderful way of saying Lets just sit awhile. Picture shows Man and woman setting on porch drinking beer. Garden tools are all around and its raining. Magazine tear sheet picture is taken through plastic and may show wrinkles or crookedness that is not in the ad. This Original magazine tear sheet measures 10 1/4 inches wide by 13 1/4 inches tall. Items Similar To "Americas Beverage of Moderation Beer 1956 Ad"